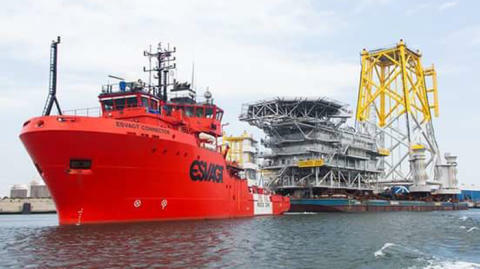 ESVAGT Helps Accommodation Module Into Position in The North Sea. 'Esvagt Connector' towing the acoommodation module. 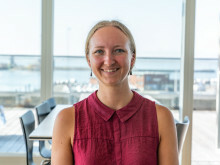 ESVAGT has developed a new way of servicing offshore wind farms with its new SOV concept but that has not stopped the shipping company assisting offshore wind farms that are run in a more traditional way. The farms, 'Gode Wind 01' and 'Gode Wind 02' that DONG Energy are building in the German sector have a permanent accommodation module, which ESVAGT is helping into position right now. Heerema Marine Contractors (HMC) has hired the 'Esvagt Connector' and the 'Esvagt Don' to tow the floating barge that carries both the accommodation module and the jacket that it will be attached to from the port of Vlissingen in Holland to the offshore wind farm in the German sector of the North Sea. Work started on the 10th of June and is expected to finish on the 20th of June 2015. In 2010, ESVAGT brought the dedicated offshore wind Service Operation Vessels (SOV) to the market. The SOVs provide accommodation for up to 40 technicians, storage for small turbine parts and a workshop, plus personnel and equipment transfer capabilities by either Walk-to-Work gangway system or Safe Transfer Boats. ESVAGT was founded in 1981 and has a fleet of more than 40 vessels and more than 900 employees on- and offshore. Colleagues on board the ’Esvagt Connector’ sent their cook on safari as a farewell trip. An exhausted Dutch fisherman was saved in the North Sea by an optimal rescue effort. The ‘Esvagt Connector’ on tow duty for the Royal Navy’s coming flagship.